On Tuesday July 3rd Dame Mary Peters, Olympian and first lady of British athletics, spoke at our Tuesday Talk and was then interviewed in the evening by sports journalist Vassos Alexander at the OSO. At this fundraising event for FiSH, the audience enthusiastically relived her gold medal winning triumph at the Munich Olympics in 1972. We are extremely grateful to Mary for entertaining and inspiring us as well as raising over £1400 for FISH. Huge thanks also to everyone who supported the event and to the OSO for hosting it. Here at FiSH we do like a good tea party! Bone china, sandwiches and cakes, scones with jam and cream... and what better excuse could there be than celebrating the marriage of Prince Harry! On Friday May 18th, the day before the wedding of Harry and Meghan, almost 100 guests came to Barnes Green for a party arranged jointly by FiSH and Age UK Richmond. Afternoon tea was served and the guests entertained by a Skiffle band! Micky Forster, a long-term Barnes resident and trustee of Barnes Community Association, will be joining FiSH Neighbourhood Care as Executive Director in February 2018. Micky says ‘’I am delighted to be joining FiSH, a charity that delivers a much needed and unique blend of practical help and emotional support to older and vulnerable people in Barnes, Mortlake and East Sheen through its amazing staff and volunteers. Having parents in their 90s still living at home in the area, I believe passionately in helping people to maintain their independence so they can do as much as they can for as long as they can. Micky started her career in sales and marketing in the airline and travel industry and has spent the last 10 years working as a fundraiser at Turn2us, Bowel & Cancer Research and Breakthrough Breast Cancer. She has also been a Samaritan’s listening volunteer for nearly 25 years. FiSH Neighbourhood Care, has won the Queen's Award for Voluntary Service. (FiSH stands for Friendship, Independence, Help and Support). FiSH exists to combat loneliness and social isolation in older and vulnerable people living in Barnes, Mortlake and East Sheen so that they continue to live independent and dignified lives. Through their 300 strong volunteer network they connect the community offering friendship, support and practical help. Receiving the Queen's Award for Voluntary Service, the MBE for volunteer groups, represents a tremendous achievement for the charity and its volunteers. Micky Forster, Director at FiSH commented “Volunteers are our life blood. We are lucky to have so many wonderful people carrying out a range of roles as befrienders, car drivers, bus escorts, minibus drivers, shoppers, listeners, cake makers, fundraisers, event organisers, dementia friends, speakers, gardeners, handy people, helpline co-ordinators and trustees. However we always need more volunteers. If you live in Barnes, Mortlake or East Sheen and have a few hours to spare, please join us. We’ll provide you with support and training and you’ll get more back than you can ever imagine”. We celebrated FiSH Sunday on February 4th, this year hosted by East Sheen Baptist Church. The theme was Back to Basics: Who is my neighbour? as we remembered how FiSH began and celebrated all that it has become. As always, the afternoon ended with lots of tea and cake and good company. St Michael & All Angels Church in Barnes celebrates it's 150th anniversary in 2017. As part of the celebrations, FiSH was invited to arrange a community tea party and this took place on Saturday October 7th 2017. With music from Saxanova, and a film by Tom Stanier about days gone by in Barnes (featuring FiSH members, Ellen and George) plus plenty of tea, scones, chat and laughter... a lovely day was had by all! ​Last year, FiSH ran a pilot series of dance classes led Rambert Ballet which proved to be extremely popular. Dance is known to have positive effects on those with Parkinsons and dementia but is also an excellent form of exercise for older people. We are delighted that the Richmond Parish Lands charity have funded a series of three terms throughout 2017. The sessions now take place every Friday morning at Barnes Green Centre. Please call Linda on 020 8876 3336 for further details or to book. Cost per session, £5. Thank you to everyone who supported our Open Gardens weekend in East Sheen. 30 gardens were open on May 20th & 21st, teas were served, Pimms was poured, classic cars gleamed and the gardens looked amazing! After a week of almost non-stop rain, we were fortunate to have good weather, enabling visitors to enjoy the gardens are their very best. Such events require a cast of thousands and we are very grateful to all those who worked so hard to make the event the success that it was. Over £8,000 was raised, a proportion of which will be shared with the Mortlake with East Sheen Society. Thank you to everyone who so generously supported FiSH via Barnes Fair. We raised £2,073.55 via our tombola, cake and plant stalls and are hugely grateful to all those who donated prizes, baked wonderful cakes, gave plants... of came to the various stalls to spend money! We had a wonderful day on Sunday February 5th 2017, celebrating FiSH Sunday and our 55th Anniversary at St Mary's Barnes. Many thanks to all those who came, made cakes and sandwiches, drove cars and buses, sang, spoke, shared their stories... and drank tea! Andy and Jenny Hughes created a 'fishnet', spinning threads across the congregation linking Helpline volunteers to FiSH clients, to FiSH befrienders and on to volunteer shoppers, back to the FiSH office, across to RaKAT, the FiSH Trustees and on to choir members, drivers, escorts, bus passengers.... reminding us all that FiSH is all about Connecting Communities. Have you got a key safe? They are an excellent idea and provide a secure way for your carers or a neighbour of your choosing to visit you without ringing the doorbell or having their own key. However if you change care agency, remember it’s a good idea to change the access number for your key safe. Do call our Helpline on 8876 3414 if you need help with this. It is also wise to give a key to your home to a trusted neighbour. We all forget our keys occasionally and find ourselves on the wrong side of a locked door! But sometimes, you may need help or need someone to reach you quickly and easily. Having a reliable key holder could make all the difference to your well-being in the event of an accident. There have been a number of local scams recently: please be extra careful when withdrawing cash at local cash machines and cover your pin number when paying for groceries at Waitrose or other supermarkets. 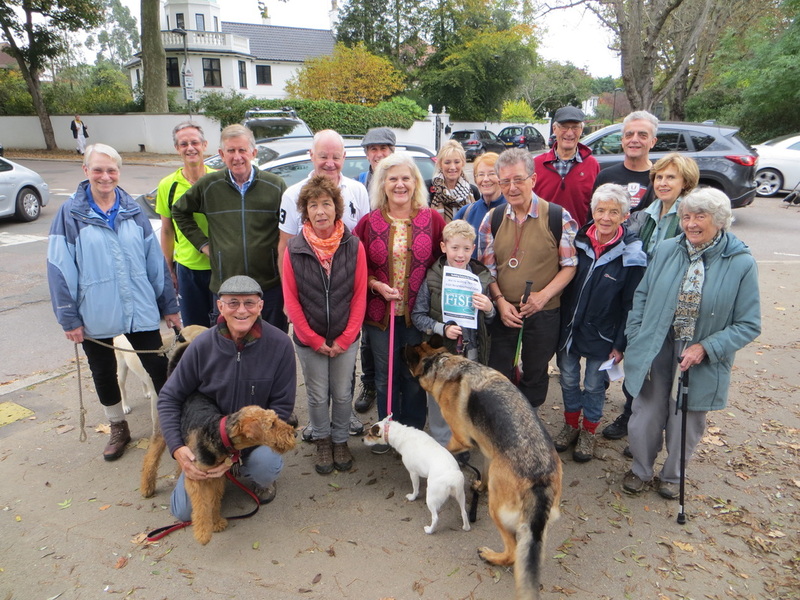 A group of trustees and friends of FiSH Neighbourhood Care set out at the end of October to raise fund for FiSH hiking together around a five mile circuit of Richmond Park. Also taking part in the sponsored walk was Cllr Brian Marcel, ‘Champion for older residents’ for LBRUT, an enthusiastic supporter for the work of FiSH in our community. The sponsored walk launched a campaign to raise enough money to pay for a new fully accessible minibus while, at the same time, ensuring FiSH can remain on a firm financial footing for the future. The target for the campaign is £50,000 and a great start was made during the walk with over £2,000 raised by the trustees. Thank you to all those who walked or made donations! If you would like to donate to FiSH click here or talk to us on 020 8876 3336 to find out about other fund raising opportunities. The annual membership fee for accessing FiSH services has remained at £10 since it was introduced some years ago. From September 2016 this is being increased to £15 and this will help us to continue providing and developing our range of services. We hope everyone will agree that this still represents very good value for money. The Singing Scales Choir is a popular activity of FiSH and is ably led by volunteer Jean Oxley, and it meets for a couple of rehearsals each month on Monday afternoons. Singing is good for your health and well-being as it can improve your breathing - but being part of choir is also good fun and provides an opportunity to meet others. New members of the choir are always welcome and the only requirement is for members to have enthusiasm! From September, the Choir will be rehearsing in a new venue: Barnes Baptist Church, Lonsdale Road. New members are always welcome. Please call the FiSH Office for further details – 020 8876 3335. Anneka Rice has been a keen FiSH volunteer for some time and regularly visits one of our clients in Barnes. She is passionate about befriending and has become an ambassador for both befriending and FiSH - and that is something we are hugely grateful for. She was recently interviewed on the ITV programe 'This Morning' and rather than go alone, she took Sylvia with her. Her challenge to those watching was 'This is not difficult, it's something anyone can do.' Immediately after the interview, our phones were red hot with calls and emails coming in from Scotland to Cornwall, Kent to Birmingham to Sunderland. There is obviously a willingness to get involved... so our challenge to those who run befriending schemes up and down the country would be to advertise your service. Together we can combat loneliness! Each month, apart from August, the FiSH Lunchtime Concert takes place on the first Friday of the month at St Michael & All Angel's Community Centre, Barnes. After a simple lunch of soup, bread, cheese, fruit and something for a sweet tooth everyone sits back for some musical entertainment. The music varies from month to month and in May we welcomed Rosalind O'Dowd who delighted her audience with a few arias followed by some favourite songs from Oklahoma! and My Fair Lady. If you have an elderly friend who loves music, why not encourage them to come to the next concert? Call 020 8876 3336 for further details. Our Helpline is open Monday to Friday from 09:00-12:00. Please do make use of this by calling 020 8876 3414 if you need help with transport for medical or social appointments or if you need some shopping done. Although we cannot help with personal care, we can help with simple things around the home like replacing light bulbs, occasional gardening tasks or at other times when you just need a useful helping hand. Please call as early as possible in the day and, for medical appointments, please try and give us at least two days’ notice. A recent Tuesday Talk given by a member of Rambert Dance received rave reviews and we are delighted that we have been able to arrange a six week series of gentle dance classes for FiSH members and others who are interested. The first session will begin at 10:30am on Friday June 17th at Barnes Green. Dance has been proved to help keep both the body and brain young so do come and join the group. The culmination of the sessions will be a visit to Rambert Studios and Archives which will take place on Saturday July 23rd. Call the FiSH office to express your interest. 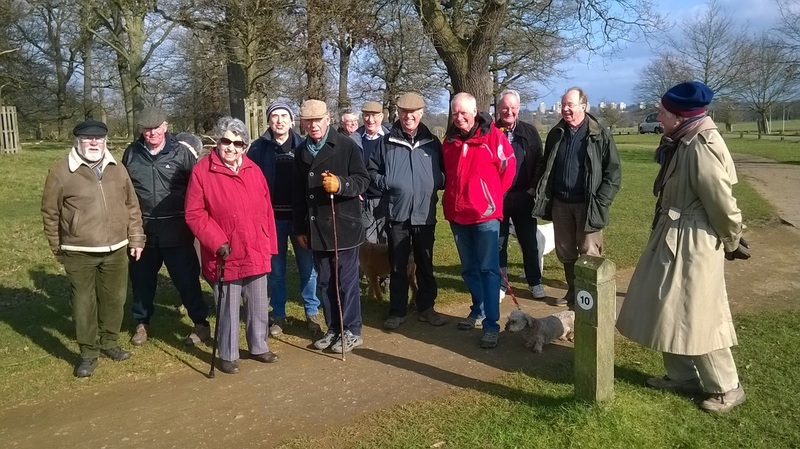 On Wednesday March 16th our Wednesday Walkers, enjoyed another bracing walk in Richmond Park. This time the group included 13 walkers and three well-behaved dogs! FiSH bus driver Annie dropped the group off at the Isabella carpark and they then walked back through Isabella Plantation arriving at the Home Guard Club for afternoon tea later in the afternoon. Next month the group will meet at Sheen Gate at 1:30pm on Wednesday April 20th with the intention of walking from Ham House along the river to Richmond. New members are always welcome. Contact Andy for further details. Our annual concert took place on Saturday November 14th 2015 at Wathen Hall, St Paul's School. Despite the ghastly weather, the concert was well attended and everyone enjoyed the music and readings, all of which followed a Shakespearean theme. Many people helped to make the evening a success and the stars of the evening were the Barnes Concert Band, Abigail Cruttenden, Joe Fraser, Denys Graham, Michael Steffan, the 'Flamin' Dames' and Alison Wilson. However, as always, there was a cast of thousands working behind the scenes for weeks beforehand and on the night. THANK YOU to you all! Our volunteers are an amazing group of people, many of whom are incredibly generous with their time - so we thought it might be nice to reward them with an outing of their own. On a gloriously sunny day in early October, one of the FiSH buses set off for a very enjoyable day in Sussex. The group visited Charleston Manor at the foot of the South Downs before going on for tea in the beautiful village of Alfriston. On Friday September 25th, FiSH held a joint Macmillan Coffee Morning at Barnes Green Centre together with AgeUK. There were lots of delicious things on sale thanks to Country Markets. An impressive £400 was raised for this good cause - so many thanks to all who contributed! A group of eight FiSH Wednesday Walkers set off together on a very pleasant sunny afternoon in February. They followed a planned route through Two Storm Wood in Richmond Park, across to Holly Lodge and then on to Cambrian Gate. Here they paused to consider the location of the South African Military Hospital which from 1916-18 accommodated up to 900 wounded South African soldiers; there are no visible traces but perhaps some spectral remnants. It was then onward to Bog Gate (the thickness of the mud in the approaches making it all too obvious why it bears this name!) The walkers then followed a path through Sheen Common and back to the Home Guard Club for tea – all in just under an hour and a half. On Wednesday 16th December the fourth gathering of the walking group met with a mission to explore the banks of the Beverley Brook. This took us down the East side of Richmond Park for the first time and our intrepid band of seven (no dogs this time) quickly reached the area of river restoration currently being undertaken by the Royal Parks. The Beverley Brook Project aims to re-naturalise the river, which over many years of ‘improvement’, has been forced into a concrete sided channel rather than being allowed to wander as a free spirited stream. The restoration area is protected from dogs and deer by fences and looks a bit bare at the moment. However, this protection will allow the natural vegetation to take hold and spread, attracting a wider range of fauna and flora. In the river itself some of the banks have been reshaped to make them less steep and logs have been laid in the river bed to break up the water flow and allow the river to re-establish some of its original meandering progress. It will take a number of years to look completely natural again and it will be fascinating to watch its progress. Having explored our target, we set off through the ominously named ‘Killcat Wood’ and climbed out of the Beverley Brook valley through Queen Mother’s Copse, over the hill and back to the Home Guard Club in time for a delicious tea provided by FiSH volunteers. A convivial band of 10 men and three dogs set off from the Home Guard Club for their afternoon walk in Richmond Park on Wednesday November 18th. It was a very blustery day and they were buffeted by the wind on all sides but cleverly timed their walk perfectly to miss the rain. Safely back inside the Home Guard Club at 3pm they enjoyed lemon drizzle cake and cups of tea provided by Jenny, Sheena and Martine while the rain did its worst outside. ﻿The first meeting of our new group for men, Wednesday Walkers, got off to a very damp start in September! Undeterred by the rain, three keen men set off from the Home Guard Club in East Sheen, went for an hours' walk in Richmond Park, before returning, somewhat bedraggled, for tea at the Club. However, they were enthusiastic enough to plan further walks in hope of better weather! If you, or a man you know, would like to join them, contact Andy for further details. We had a marvellous evening on Saturday November 15th when we presented Memories & Music from the 'Great War' in the beautiful Wathen Hall at St Paul's School, Barnes. The event was supported by the Heritage Lottery Fund and featured filmed interviews of FiSH friends and volunteers recounting memories of the First World War. The evening was linked together by a selection of music, readings of letters from the front and community singing. We are hugely grateful to Peter Snow, Anthony Calf, Buffy Davis, and Denys Graham for their professional contributions and to Jessica Hughes, Barnes Community Choir, and Barnes Concert Band for making all the music go with a swing, an also to the staff and boy's at St Pauls for all their help both on stage and behind the scenes! Tom Stanier's brilliant film, Memories of the Great War, proved to be a very moving tribute to those who served and gave their lives during the War.